This most sacred of Russian Orthodox churches combines Russia's Byzantine heritage with the art and architecture of the Italian Renaissance. 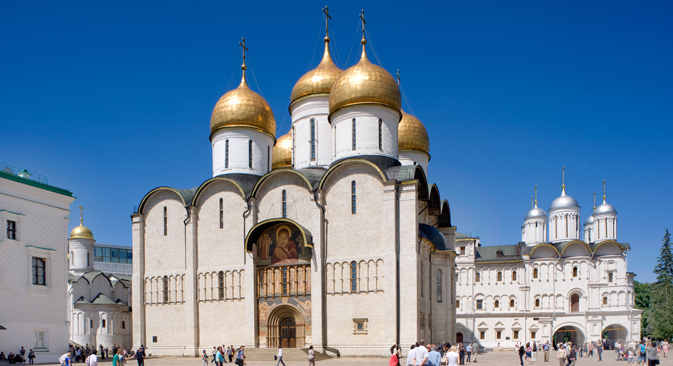 Russia has many sacred sites, but none is more important to the country’s identity than the golden-domed Dormition (Uspensky) Cathedral in the Moscow Kremlin. For centuries, this cathedral was Russia’s most elevated monument — at the center of its history, its politics, its culture and its Orthodox faith. Even after the founding of St. Petersburg, the coronation ceremony of each ruler of Russia occurred in this cathedral, including the coronation of the last emperor, Nicholas II on May 26, 1896. As of 1991, it is once again the Patriarchal Cathedral of Russia. The Dormition Cathedral is dedicated to one of the most venerated and complex mysteries in Orthodox theology, the Dormition of the Mother of God, which refers to the transposition of Mary from this world to the heavenly sphere. Orthodox iconography portrays the recumbent Mother of God, surrounded by apostles, as falling asleep — hence the term “dormition” (in Russian “uspenie”) from the Latin verb dormire, “to sleep.” At this moment — in effect, Mary’s death — Christ accepts Mary’s soul into heaven three days before her “assumption,” in which her resurrected body is miraculously taken to heaven. The origins of the Kremlin Dormition Cathedral are closely connected with the rise of Moscow’s power. In 1326, the leading Russian church prelate, Metropolitan Peter of Vladimir, made the Moscow Kremlin his de facto residence. The prelate’s health was in decline, and it was felt that the Moscow court could provide better care. This move, carefully cultivated by Grand Prince Ivan I (Kalita), was fraught with significance not only for the political and religious status of Moscow, but also for its architectural development. In 1326 Ivan, with the participation of Peter, laid the foundation stone for the Dormition Cathedral. Later in 1326, Peter was buried within the cathedral walls in a tomb that he had himself prepared, thus endowing the site with added religious significance when Peter was canonized in 1339. The cathedral’s dedication to the Feast of the Dormition symbolized the continuity with the great Dormition Cathedral in the town of Vladimir, political center of early Russia. To get to the Uspensky Cathedral get off at the Biblioteka imeni Lenina subway station. In 1448, the Russian church elected its own metropolitan, becoming official independent of the Orthodox patriarch in Constantinople. When Constantinople fell to the Turks in 1453, Moscow saw itself as the sole defender of the Orthodox faith. To enhance Moscow’s new authority, Ivan III (1463-1505) launched a major rebuilding of the Kremlin, including its walls and towers. A central part of the project was the reconstruction of the antiquated Dormition Cathedral with the support of the leader of the Russian Church, Metropolitan Philip. Moscow lacked the technical expertise for such ambitious projects, and Ivan therefore hired a number of Italian architects, of whom the most notable was Aristotele Fioravanti. The accomplished architect arrived in Moscow in 1475 and promptly undertook the rebuilding of the cathedral. Fioravanti was instructed to model his structure on the Cathedral of the Dormition in Vladimir, which he visited. Although his design incorporates features of the Russo-Byzantine style (particularly the large central cupola, with lesser cupolas at the corners), the architect also introduced a number of innovations: stout oak piles for the foundation, solid masonry bonding for the walls, iron tie rods for the vaulting, and strong bricks (instead of stone) for the vaults and cupola drums. The limestone exterior reflects the perfect proportions of the square segments of the plan, and the interior — with round columns instead of massive piers — is lighter and more spacious than any previous Muscovite church. The unity of the sculpted form is especially evident in the design of the south wall, the main facade opening onto Cathedral Square. The richly painted arches of the south portal are framed by iconic wall paintings, including the portrayal of saints within the blind arcade — a technique similar to that applied on the surface of the Dormition Cathedral in Vladimir. The Dormition Cathedral displays in grand form the Russian Orthodox practice of painting the walls and ceiling vaults with scenes from the Bible and the lives of the saints. Work on the painting of the interior began soon after the completion of construction work in 1479, and by 1515 the entire space was covered with frescoes. In addition an iconostasis of three rows was painted in 1481 by the renowned artist Dionisy and his assistants, who may also have been involved in the painting of the original frescoes. The interior of the main dome traditionally has an image of Christ Pantocrator (Ruler of All), while above the altar, the apse is devoted to an image of Mary Mother of God standing in a pose that indicates a blessing extended to the worshippers. This array of images integrated the structure with the sacred teachings of Orthodoxy. Over the south portal is a monumental fresco of the Vladimir Mother of God, Russia's most revered iconic image. The icon is currently displayed in the cathedral part of the year. The sacred image (and the portal) are guarded by representations of the primary archangels, Michael and Gabriel. Below the Vladimir image is a majestic blind arcade with paintings of four Muscovite prelates as well as bishops Nikita and John of Novgorod. On either side of the portal are two angels with quills recording the names of those entering the cathedral. Immediately above the portal arches is the Miraculous Image of the Savior. The door is crowned with a representation of Christ, Mary and John the Baptist. The north wall faced the residence of the head of the church — now known as the Patriarch's Chambers — and therefore displays an ecclesiastical emphasis. The arched frieze above the north portal contains paintings of six venerated prelates: St. Pafnuty of Borovsk, bishops Isaiah, Leonty and Ignaty (all from Rostov), and Saints Dmitry Prilutsky and Sergius of Radonezh. These figures represent the far reaches of Muscovite territory, with special emphasis on Rostov, whose Archbishop Vassian was the confessor of Ivan the Great. Above the frieze is a painting of the Assembly of the Apostles — Christ, the Blessed Virgin, John the Baptist and the 12 Disciples. The intricate east façade consists of a five-part apse containing the cathedral altars. Extending slightly from the central block of the temple, the five curved structures are screened by massive pylons at either corner. The complex structure is unified by large attached columns and plinth molding to create a monumental form facing the main passage to the Cathedral Square. As befitting the space containing the altar, the images on the east wall are the most august from a theological perspective. Over the central apse is a fresco of the "New Testament Trinity" (God the Father, the Son and the Holy Spirit in the form of a dove). The space to the left is devoted to the Orthodox holiday "The Praise of the Mother of God." And on the right is a depiction of the Divine Sophia, or Heavenly Wisdom. The main cathedral of Novgorod was dedicated to Sophia, and thus the fresco can be interpreted as another symbol of the joining of Novgorod to Muscovy. The west façade — which in the Russian tradition was the "front" of the church with the main entrance — was constricted by nearby Kremlin buildings and is less imposing. The façade originally contained a depiction of the Dormition and scenes from the Apocalypse. The large porch was damaged by the Moscow fire of 1547 and modified in the 19th century. The culmination of the cathedral's exterior is the ensemble of five gilded cupolas over the central and east bays. It is thought that the original domes were made of plates of "German" iron, prepared in Novgorod and polished to a high gloss. After a fire in 1547, the domes were reconstructed and covered with gilded copper sheets, which give a particularly rich hue to the gold surface. On the interior, the sense of spaciousness created by Fioravanti's design and technical innovations was enhanced by the decision to eliminate a significant and traditional element in the design of Russian masonry churches: the choir gallery. Thus the entire interior, from the iconostasis to the west facade, was washed in a natural light that illuminated the vibrant colors of the frescoes and icons. Conceived as a grand and solemn space for the crowning of Russian rulers and the investiture of the leaders of the Russian Orthodox Church, Fioravanti's Cathedral of the Dormition represents the felicitous meeting of two cultures: Russian — including its Byzantine heritage — and western European, as expressed in the architectural genius of the Italian Renaissance.